Background. Dolutegravir (DTG) is an integrase strand-transfer inhibitor (INSTI) used for treatment of human immunodeficiency virus (HIV)–infected individuals. Owing to its high genetic barrier to resistance, DTG has been clinically investigated as maintenance monotherapy to maintain viral suppression and to reduce complication and healthcare costs. Our study aims to explain the underlying mechanism related to the emergence of a S230R substitution in patients who experienced virologic failure while using DTG monotherapy. Methods. We evaluated the effect of the S230R substitution in regard to integrase enzyme activity, viral infectivity, replicative capacity, and susceptibility to different INSTIs by biochemical and cell-based assays. Results. The S230R substitution conferred a 63% reduction in enzyme efficiency. S230R virus was 1.29-fold less infectious than wild-type virus but could replicate in PM1 cells without significant delay. 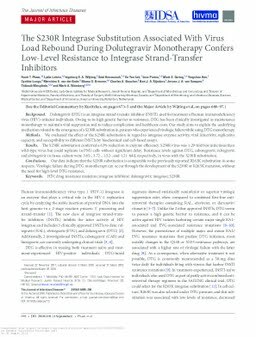 Resistance levels against DTG, cabotegravir, raltegravir, and elvitegravir in tissue culture were 3.85-, 3.72-, 1.52-, and 1.21-fold, respectively, in virus with the S230R substitution. Conclusions. Our data indicate that the S230R substitution is comparable to the previously reported R263K substitution in some respects. Virologic failure during DTG monotherapy can occur through the development of the S230R or R263K mutation, without the need for high-level DTG resistance.